Return to the Empire of Isles and journey to Karnaca, where 15 years after her removal from the throne, Empress Emily Kaldwin and her father Corvo Attano seek to reclaim her kingdom. 2016 video game Dishonored 2 chronicles their quest. At Superheroes Direct, we offer a selection of officially licensed Dishonored 2 collectibles and apparel from this action adventure game of stealth and discovery. Shop fun vinyl collectibles like our Dishonored 2 Emily POP Figure as well as figures featuring the masked Corvo and the mysterious, power-granting Outsider. Keep checking back for updates to our Dishonored 2 merchandise, such as Dishonored 2 t-shirts, accessories, and more featuring the elements and characters from the imaginative world of this hit video game. 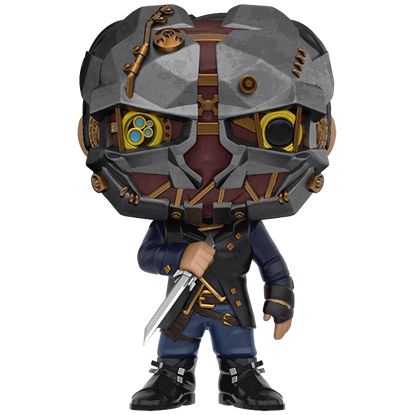 The Dishonored 2 Corvo POP Figure presents the supernatural assassin of the Arkane Studios video game series as a trendy Funko collectible. Corvo Attano serves as bodyguard to his daughter, Empress Emily Kaldwin, in the sequel. After an otherworldly usurper steals her throne, Empress Emily Kaldwin vows to restore her rule. She does so in the sequel to an award-winning game. 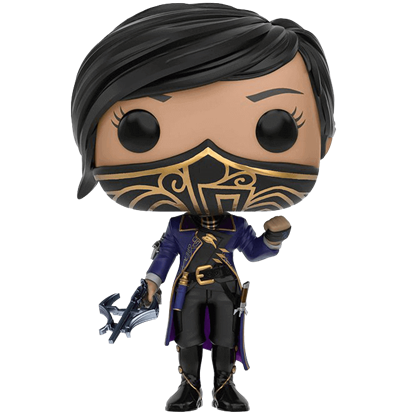 She appears in a trendy, collectible form as the Dishonored 2 Emily POP Figure.